Diana Containerships announced that, through a separate wholly-owned subsidiary, it has entered into a time charter contract with Hyundai Merchant Marine Co., Ltd., Seoul, for one of its Panamax container vessels, the m/v Pamina.The global shipping company specializing in the ownership of containerships said that the gross charter rate is US$11,950 per day, minus a 5% commission paid to third parties, for a period of minimum eight months to maximum 12 months.The charter will commence on August 24, 2018. 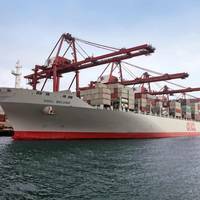 Hong Kong-based container shipping and logistics service company Orient Overseas Container Line (OOCL) reported revenues for the first quarter of 2018 at $1.38 billion, up 16.3 percent from the first quarter of 2017. OOCL carried 1,579,578 TEUs in the same period 7.5 percent more than in the same 2017 period. A press briefing said that the loadable capacity increased by 16.0% and the overall load factor was 6.4% lower than the same period in 2017. 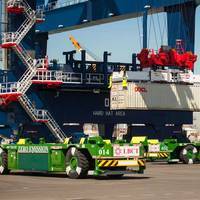 Overall average revenue per teu increased by 8.3% compared to the first quarter of last year. A U.S. national security review has raised concerns about a takeover by China's COSCO Shipping Holdings Co of a large container terminal in Long Beach, California, the Wall Street Journal reported on Friday.The terminal is part of COSCO's planned $6.3 billion deal to buy shipping firm Orient Overseas International Ltd (OOIL) , the Journal reported, citing people familiar with the matter.COSCO executives met with officials at the Committee on Foreign Investment in the United States (CFIUS) this week and proposed to divest or carve out the Long Beach terminal to ease U.S.
Deal waiting for green light from CFIUS, China regulators; COSCO says keeping close eye on US-China trade tensions. COSCO Shipping's planned acquisition of Orient Overseas Container Line (OOCL) is on track to be completed by the end of June, the company's vice chairman Huang Xiaowen said on Tuesday. COSCO is still answering questions from the Committee on Foreign Investment in the United States on the deal, and is also awaiting a number of domestic approvals, Huang told a press conference in Shanghai. He said the deal needed U.S. approval as OOCL had some assets in that country. 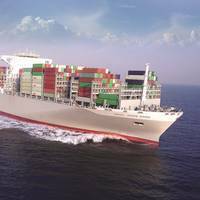 Following the success of the Day One products introduced earlier this year, Orient Overseas Container Line Limited (OOCL) announced the forthcoming launch of the second phase of the OCEAN Alliance products in April 2018, an improved suite of products providing industry-leading services to customers. 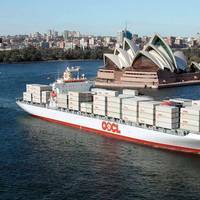 The emphasis on quality services has long been the hallmark of the OOCL brand. Since the inauguration of our services in April 2017, OOCL has made steady progress to meet the requirements of our customers as they find that we are among the top performers in terms of schedule reliability. Shell Marine said it has been awarded China Ocean Shipping (Group) Company’s (COSCO SHIPPING) largest marine lubricants order in 2017. 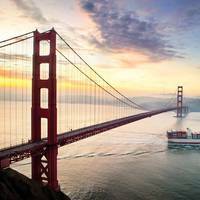 This order will include the full range of marine lubricants and technical services for seven out of COSCO SHIPPING’S 10 new generation Ultra Large Container Carriers (ULCCs) with capacities of approximately 20,000 TEUs each, ordered in 2015 and due to be in service from 2018-2019. Shell Marine has supplied marine lubricants and services to over 140 COSCO SHIPPING vessels since 2004. The world’s largest containership received a special greeting when it arrived for the first time at Germany’s sole deepwater port. 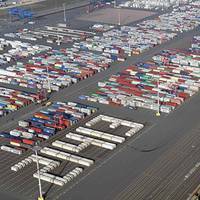 On October 16, EUROGATE welcomed the 21,413 TEU OOCL Germany at its container terminal in Wilhelmshaven, where employees had arranged containers on the stowage area to write out the ship’s record-setting TEU capacity. “Although we are in the meantime witnessing the world’s largest container vessels at Wilhelmshaven on a weekly basis, each occasion is still something very special,” said Mikkel Andersen, Managing Director of EUROGATE Container Terminal Wilhelmshaven. Diana Containerships Inc. said plans to reactivate one of its idle Panamax container vessels, the m/v Pamina, a 5,042 TEU container vessel built in 2005. The company also announced that, through a separate wholly-owned subsidiary, it has entered into a time charter contract with Orient Overseas Container Line Ltd., Hong Kong, for the m/v Pamina. The gross charter rate is $9,500 per day, minus a 3.75 percent commission paid to third parties, for a period of minimum seven months to maximum 12 months. The charter will commence on September 13, 2017. This employment is anticipated to generate approximately $2 million of gross revenue for the minimum scheduled period of the time charter. 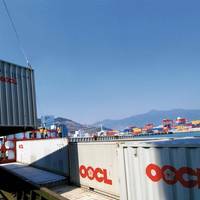 Orient Overseas Container Line (OOCL) has appointed Shell Marine to provide its integrated marine solutions, which include lubricants and services for OOCL Hong Kong. OOCL Hong Kong, currently plying routes between Asia and Europe, is the latest vessel to claim the title of ‘world’s largest containership’, with a capacity of 21,413 twenty-foot equivalent units (TEUs), measuring 400m in length and 59m in width. The ship is equipped with MAN Diesel & Turbo’s (MDT) G-type engines that represent the latest in two-stroke engine technology. Chinese Shipping Major Cosco Group has agreed in principle to buy its shipping rival and Hong Kong’s No. 1 box mover, Orient Overseas Container Line (OOCL), in deal that could be valued around USD 6.3 billion. The takeover will catapult Cosco the world’s third-biggest container carrier after Denmark’s Maersk Line and Swiss-based Mediterranean Shipping Co. In a press release, the State-owned Cosco said that it will pay shareholders of OOCL,, HK$78.67 a share in cash, a 31 percent premium over the stock’s last closing price. 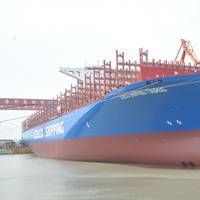 The weekly Ocean Alliance NEU4 service, operated by French-based CMA-CGM, will link the port of Zeebrugge with the Asian ports of Tianjin, Qingdao, Shanghai, Ningbo, and Yantian, China as well as Busan, Korea, beginning with the first call of the 13,380 TEU capacity APL Changi on May 16th. The NEU4 service is one of six Asia/North Europe services offered by the Ocean Alliance, which began operations on April 1st with CMA CGM, COSCO Container Lines, CMA CGM, Evergreen Line and Orient Overseas Container Line as members. 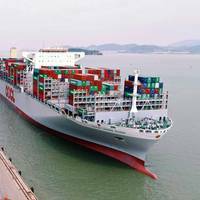 Orient Overseas Container Line (OOCL) announced the naming of its latest containership, the OOCL Hong Kong, at a christening ceremony held at the Samsung Heavy Industries (SHI) shipyard on Geoje Island on May 12. The OOCL Hong Kong was also celebrated as one of the largest containerships in the world by carrying capacity, and will be a welcome addition to strengthening the OOCL fleet this year. In his ceremonial remarks, C. C. Tung, Chairman of Orient Overseas (International) Limited addressed the importance of this occasion for the company.